The present list ranks laureates under the country/countries that are stated by the Nobel Prize committee on its website. The list does not distinguish between laureates who received a full prize and the majority who shared a prize. Some laureates are listed under more than one country, because the official website mentions multiple countries in relation to the laureate. If a country is merely mentioned as the place of birth, an asterisk (*) is used in the respective listing to indicate this. In this case, the birth country is mentioned in italics at the other listings of this laureate. Tunisian National Dialogue Quartet, Peace, 2015. 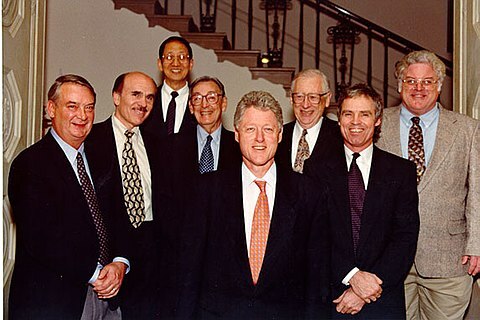 President Clinton meets the 1998 U.S. Nobel Prize winners in the White House. ↑ Statistics about the Nobel Prize at the official website. ↑ Chronological list of All Nobel Laureates on the official website of the Nobel Prize committee. ↑ Example of an award applied to more than one country. ↑ Example of a birthplace mentioned in addition to the country the award is applied to.